Celeste Jankowski does not remember a moment in her life without classical music. Her earliest memory is nap time at age three. She would be placed in a big comfortable chair next to the grand piano and would fall asleep listening to her mother practise Chopin’s Etudes. These etudes still remind her of her early childhood and hold a special place in her heart. Her mother, a classical pianist and a passionate lover of music, had a great influence on all of her children’s musical education. All four children are accomplished string players. At age five, Celeste begged her mother for violin lessons after hearing her older sister play. The following year, Celeste (and her mother and older sister) traveled to Tokyo, Japan to study for three months with the renowned pedagogue, Dr. Shinichi Suzuki. Soon after her trip to Japan, she was accepted into the Washington D.C. Youth Orchestra Program, where her love of playing orchestral music took hold, and the rest is history! Celeste holds a Bachelor of Music degree in Violin Performance from the New England Conservatory of Music in Boston and is currently a member of the First Violin section of Symphony Nova Scotia. She has also performed for many years as a member of two early music ensembles: La Réjouissance and Tempest Baroque Ensemble. Celeste’s greatest joy in her musical life is teaching young people. 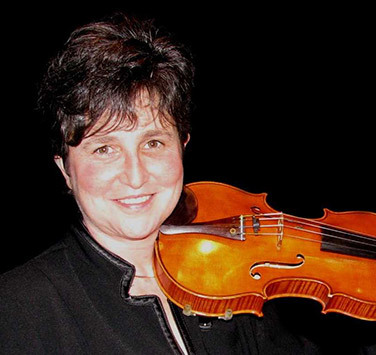 She is the First Violin coach for the Nova Scotia Youth Orchestra and the conductor of the Chamber Orchestra at the Maritime Conservatory of Performing Arts. She loves to share her passion for music with others.